. . . You might even say it compares to David, going against Goliath . . . Here's a rather remarkable Programmer's Digest Profile published in Volume I, Issue 16 on June 4, 1973. The station is WYRE in Annapolis, Maryland  a 250-watt daytimer surrounded by dozens of better signals. The profile begins with an introduction by Jim Cooper, of WMAK in Nashville, TN. This exhibit is from the original vinyl. 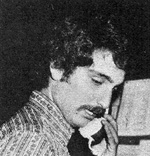 Dennis Constantine, 1973 At the time of publication by REELRADIO, June 2012, Dennis Constantine is programming KFOG in San Francisco, so he apparently really was as bright and talented as you will hear him here  39 years ago. This composite features some of the most familiar voices in the Baltimore-Washington D.C. market, including Paul Rogers, David Jones, Jim Tice, and two "newcomers", Charlie Rivers and Sandy Gannon. Reel Top 40 Radio Repository ©2012 REELRADIO, Inc.